Damn, what a cover! It's just mesmerizing! 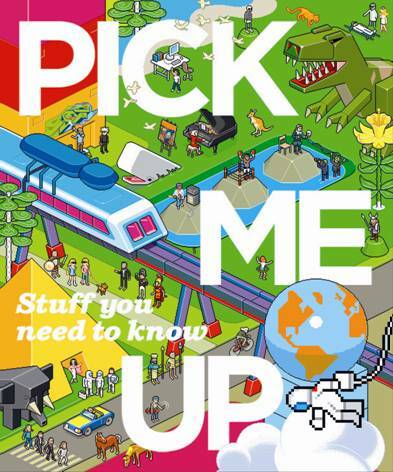 I'm referring to the cover of the book Pick Me Up- Stuff you need to know... , of course (yeah, of course, obviously, duh, what else would I be talking about!). The cover just grabs your attention and doesn't let go... or actually, it's not really the cover, it's an insert placed in front of the cover. It's one of those 3D-looking plastic things, you know the ones where you look at different angles and see different images, except that this thing uses the various layers to show depth, not alternate images. The book is shrinkwrapped, with that 3D insert thing on the front of it. The actual cover of the book has the same image as the 3D insert, but is just a normal image same as any other book. Anyway, so now I gotta tell you about this book, cause it's pretty cool. There's no story and no plot... basically, it's just full of random information. I know, I know, sounds boring, like reading a dictionary or something, but surprisingly it's actually fun to read. Each page is laid out differently, so you never know what to expect when you turn the page, and there are tons of pictures (both drawn and photographs) to go along with all the information. Plus, there is a lot of humor peppered throughout all the various facts and trivia. Also peppered throughout pages are "links" to other sections of the book. They work kind of like hyperlinks do in webpages, but instead of clicking on them with your mouse, you actually have use your fingers (or whatever other extremity you prefer) to turn to the page number listed next to the link. This would be quite useful if I wasn't so damned lazy. Each of these categories is assigned a color code at the beginning of the book. At the top of each page there is a rectangular box that gives a little info about what you'll find on the page, and color of the box tells you to which section it belongs. Now, the target audience for this book is adolescents, but both my wife and I find it interesting, so based on that I have come to the completely unscientific conclusion that this book is really for anyone. Just put it on the coffee table and you'll be sure to be constantly picking it up and reading it.